Your Walther P22 can be your right hand man, when it comes to self defense (or left hand man, but now we’re just splitting hairs). We consider this handgun to be seriously underrated when it comes to the best pistols for carrying, so it can be difficult to find holsters that you can be certain will fit its shape and size. We’ve put together this review of the best Walther P22 holsters, and, as always, we’ll let you know which option we think is the best for most gunowners. While you could maybe conceal the Walther P22 in an inside the waistband holster, the five inch barrel will make that pretty tricky and probably uncomfortable for most of you. An outside the waistband holster is really the best way to go. We tried to put together a list of holster options that would fit a variety of interests. Some of you may be looking for a holster that allows you to fully conceal your Walther P22 under a shirt without anyone noticing. Others may not care so much about this and would prefer an outside the waistband holster that will look good and impress your friends (hey, nothing wrong with that either). Whichever of these sounds more like you, it will still be important to choose a holster that will carry the weight of this handgun as well as keep it secure against your body while driving, walking, or going about daily activities. We think there’s something for everyone in this review. Materials – The OutBags USA Nylon Outside Pants Carry Holster is an all black OWB holster made of 600D nylon. 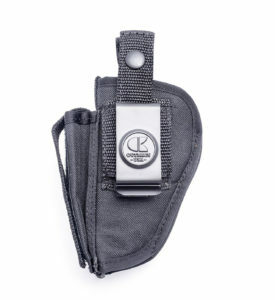 It also has a magazine pouch for additional ammo, which has a Velcro closure. There is a nylon thumb break, which has a snap closure and is adjustable. There is also a reinforced belt clip for securing to the waist that is constructed of steel. The outer edges of this outside the waistband holster have additional stitching to enhance a smooth draw, and the interior of the holster has a soft material to keep your Walther P22 safe from any scratches. Performance – The OutBags USA Nylon Outside Pants Carry Holster is a pretty basic OWB holster that is affordable and covers basic needs. Although it is not an IWB holster, it is very easy to conceal under a shirt or jacket without it poking you in the waist during your daily activities. Don’t expect an all nylon holster to fulfill all your tactical needs, but it is a great option for concealed carry and self defense. The steel clip is much stronger than many other plastic or polymer belt clips you’ll see on the market, so you’re getting slightly more bang for your buck. What we say – The OutBags USA Nylon Outside Pants Carry Holster costs about $18 online. 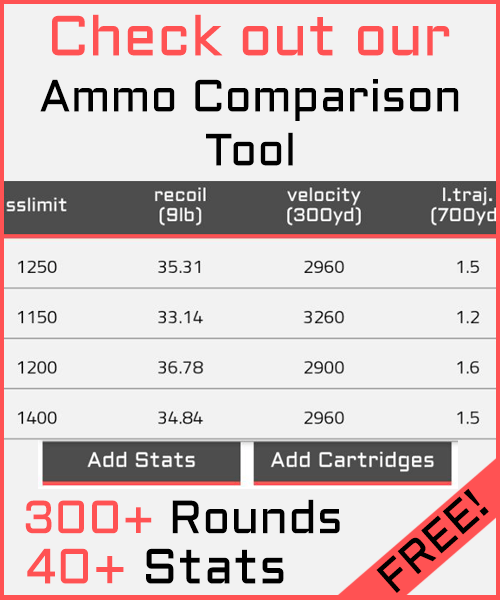 That is a super cheap price for a holster that a lot of gunowners would be happy with. Hooray! Materials – The Fobus Standard Holster Paddle has two components: a Kydex holster and a rubberized paddle. 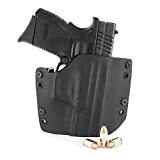 This is an outside the waistband holster, and it comes in all black. The Kydex holster is molded to the shape of your Walther P22, and it has retention screws in four places – two under the trigger guard and one at each point of the barrel. The rubberized paddle is wide enough to evenly distribute your handgun’s weight on your pant’s waist, and it is flexible enough to curve to the shape of your body. The Fobus Standard Holster Paddle comes with a “no questions asked” lifetime guarantee. Performance – The Fobus Standard Holster Paddle is a great option for gunowners who don’t trust a single, metal clip to secure their Walther P22 to their waist all day, and we don’t blame you! Paddle holsters are one of the best solutions to this problem, and the slightly flexible material on this one makes it comfortable but sturdy. The Kydex holster itself is molded very well, but we wish it covered slightly more surface area of the handgun. This isn’t a deal breaker, but it may make some users nervous. However, the multiple retention screws should help alleviate those feelings. What we say – The Fobus Standard Holster Paddle costs just over $25 online, so this is another wallet friendly option that offers a little more weight distribution. 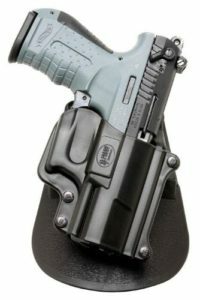 Materials – The R&R Holsters OWB Kydex Holster is entirely constructed of Kydex that is less than a tenth of an inch thick. 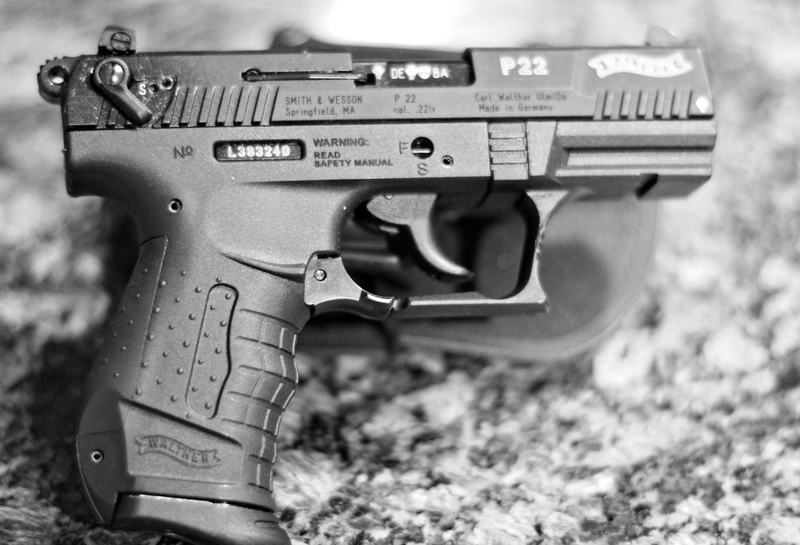 The Kydex is molded to the shape of your Walther P22 for the best and secure fit. 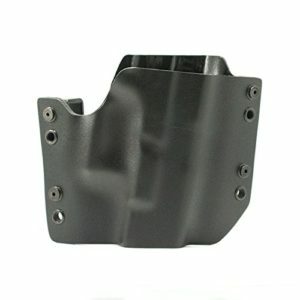 There is a partial sweat guard backing, so damaging sweat cannot penetrate the holster. The cant is adjustable from zero to fifteen degrees, so your draw is as functional as possible. There are two belt loops (one on each side of the holster), which can be adjusted for the aforementioned cant. Tightening the belt loop screws will also help build retention. This OWB also comes with a one year replacement warranty. Performance – The R&R Holsters OWB Kydex Holster is similar to the previous option in how it distributes friction and weight. However, this product conceals more surface area of the weapon. The one thing we don’t like about this holster is we think it leaves just a little too much room for your Walther P22 to rock back and forth slightly, but you can adjust the cant and retention to make up for this. The two belt loops allow you to wear the holster high and tight against the waist, so your handgun won’t be going anywhere during your active lifestyle. What we say – The R&R Holsters OWB Kydex Holster costs $30. You won’t be emptying your wallet on this one, and you should be pretty happy with the concealment you get out of it. Materials – The Tagua Thumb Break Belt Holster is made of high grade leather, which comes in a tan color. The leather has been molded to the contours of your Walther P22, and it has a belt loop at each end of the holster, making it an OWB option. There is reinforced stitched across multiple areas, including under the trigger guard, around the belt loops, around the exterior of your handgun, and along the thumb break. The thumb break itself has a snap closure for easy access. The interior of the Tagua Thumb Break Belt Holster is lined with a softer material to aid in both a smooth draw and holstering, as well as to keep your Walther P22 protected from damaging elements. Performance – The Tagua Thumb Break Belt Holster is easily the most appealing and gorgeous holster within this review, and it’s also the holster that will be the most secure against your body. The molded leather is highly contoured, and it’s very resistant to exterior elements like protruding surfaces and sweat. There is stitching for reinforcement throughout, so every inch of the holster is retaining your Walther P22. The thumb break is, by far, the strongest one within this review as well. If you’re having a good appearance is important to you in a holster, look no further than this choice. What we say – The Tagua Thumb Break Belt Holster’s price tag is a couple dollars under $50. 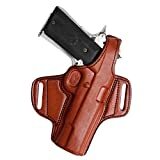 This makes it the most expensive option within this review; but, for a leather holster, this is a fantastic price. Our top pick for the best Walther P22 holster goes to the R&R Holsters OWB Kydex Holster. Since all of the options we listed within this review were outside the waistband holsters, we wanted to pick the one that concealed the best and had the lowest profile. The R&R holster covers a lot of surface area of your handgun while also evenly distributing the friction across your waist. Instead of depending on a single metal clip to do all the work, you have two points of attachment to carry the weight of your handgun. We did mention that there is some room for your handgun to rock back and forth, but this is quite minimal. Plus, you can adjust the holster so it fits tight against the body, allowing you to conceal it with a shirt or other clothing. It may not be the prettiest holster to look at, but it keeps your self defense weapon discrete, and it covers all the criteria we mentioned at the beginning of this article. It will only cost your $30 to pick up the R&R Holsters OWB Kydex Holster, so grab it now before they’re all gone!